This is part eleven of a twenty-five part series chronicling my budding collections of the 2016 World Series champion Cubs. Obviously, I’ve already starting showing off some of those cards, but I wanted to offer a formal introduction to the various players. With my legacy player collections, I’m still going to attempt to show every single card on the blog, but with these new guys I’m taking a different approach as you’ll see here where I lump cards in one scan, and will probably skip many of the more basic cards I get unless I can get a good theme together. I think it’s about time I start mixing in a few of the bigger names again. I’ve covered most of the guys with a smaller amount of cards to chase and most of the relief pitchers. Let’s take a look at the second starter to be featured. I started my collection with only two cards, both from the team blister sets. That shouldn’t be too surprising since Kyle didn’t have a ton of cards up through 2016. Kyle was drafted by the Angels way back in 2008, but never signed. Then he re-entered the draft in 2011 after attending college and his stock rose from the 39th round to the 8th with the Rangers. 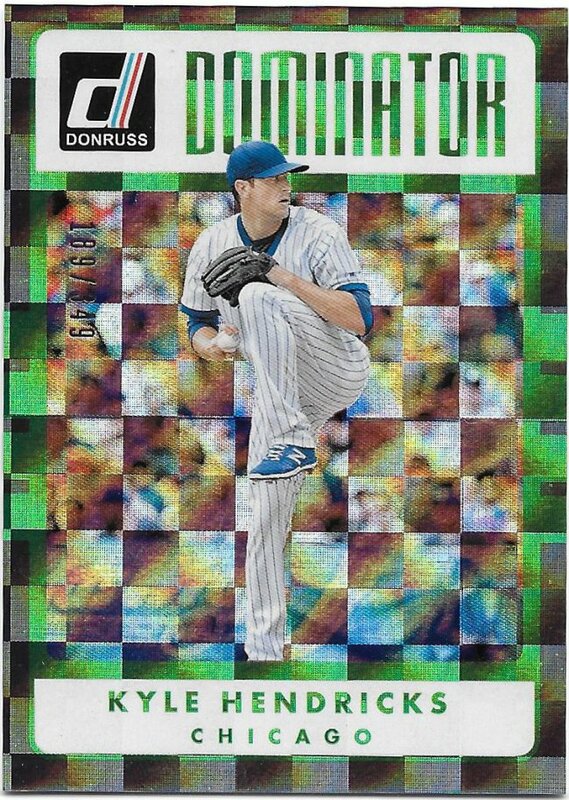 I didn’t have any Rangers cards to show until very recently but he did appear in one year of Bowman Chrome. 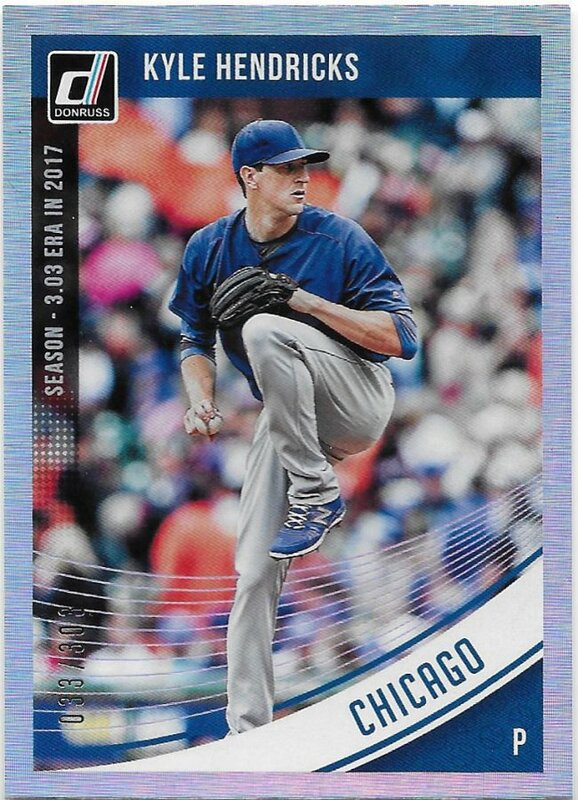 The next year Kyle Hendricks was traded to the Cubs along with Christian Villanueva in exchange for my player collection guy Ryan Dempster. 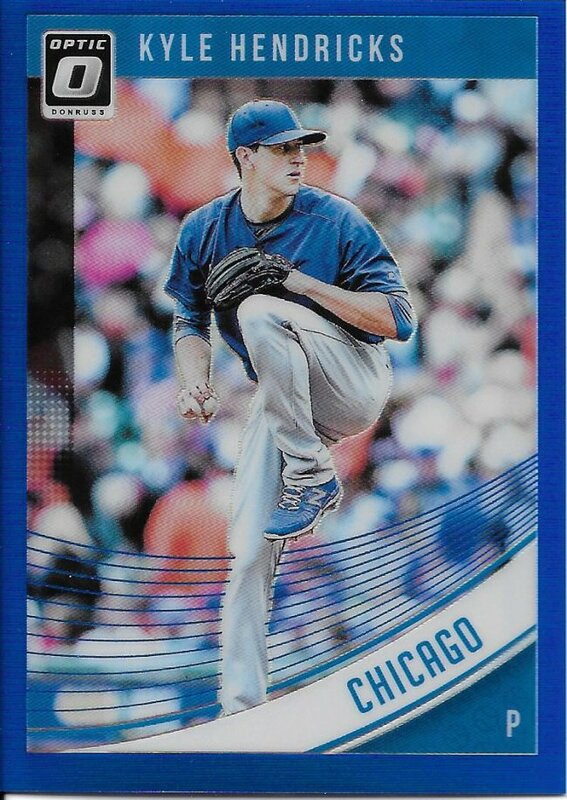 He then quickly rose through the minor league ranks and was named the Cubs minor league pitcher of the year for 2013. 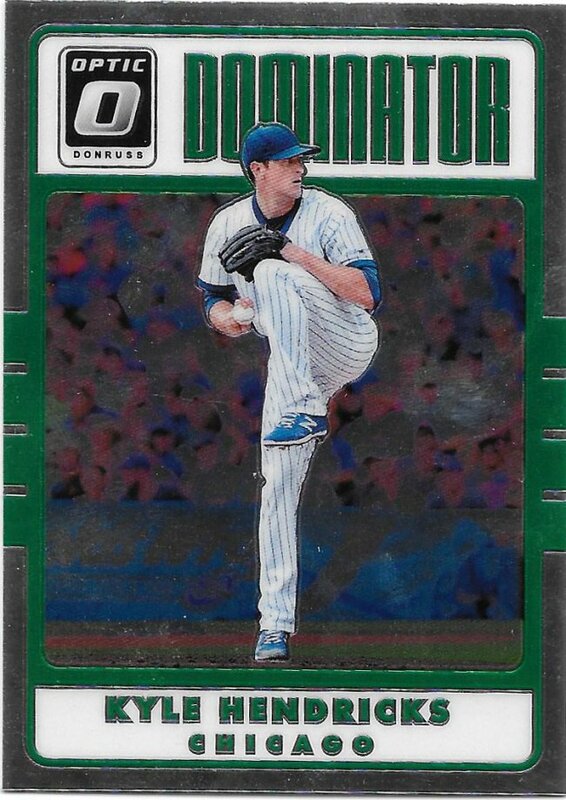 In 2014, he made his MLB debut to take the place of traded starters Jeff Samardzija and Jason Hammel. Kyle earned the honor of Rookie of the Month for August and actually ended up finishing in the top ten (7th) for ROY voting. The 2015 season wasn’t as strong, but still better than most Cubs fans would have expected. He ended the season with a barely sub 4.00 ERA and a winning record (despite 17 no decisions). That whole season was quite surprising for the Cubs and led to a lot of high expectations for the next year. 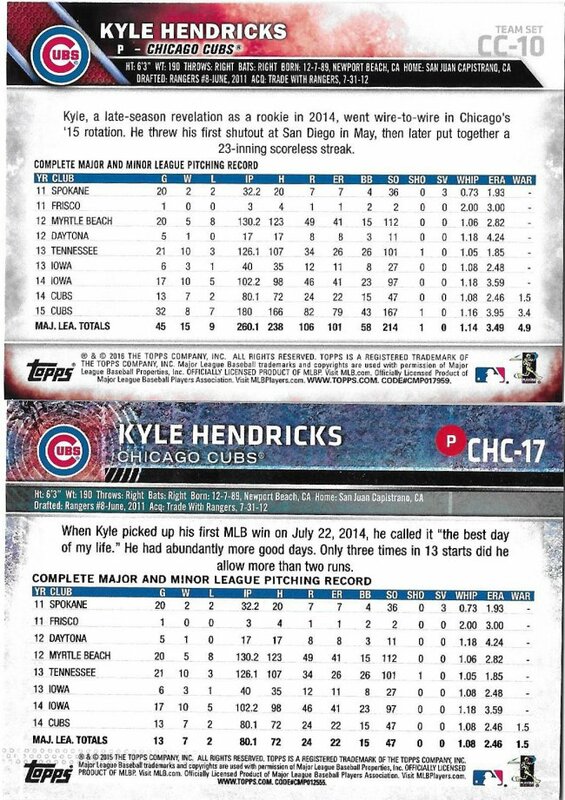 Hendricks fulfilled those expectations by leading all of MLB in ERA for the year and ending the season with a WHIP under 1.000. He also almost got himself a no-hitter against the Cardinals. 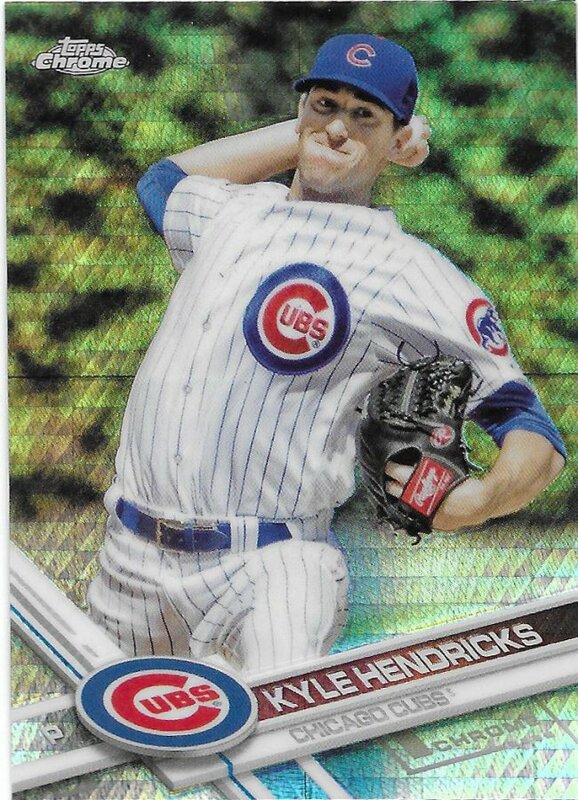 He was a key part of a very effective rotation that lead the Cubs to the playoffs. In the playoffs, Kyle largely continued his success. 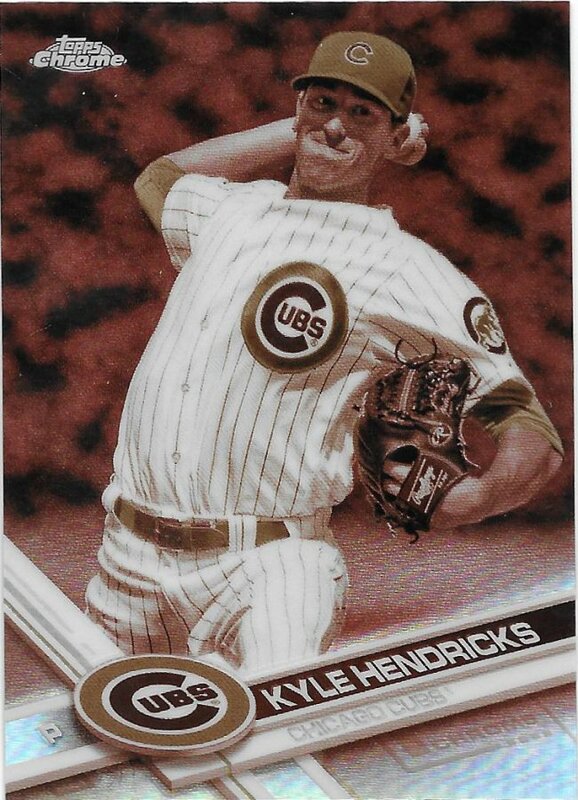 In the NLCS, he notched 11 Ks over two games, but still lost one despite only giving up 1 run in those two appearances. He pitched 7.1 innings in the clinching game 6. Then in the World Series, he pitched two games, including the classic game 7. 1 Earned run and 8 Ks in those two games as well. His performances drew a lot of comparisons to Greg Maddux and earned him the nickname of The Professor as a result. The next two years didn’t match the magic of 2016, but he’s still been quite good and consistent. 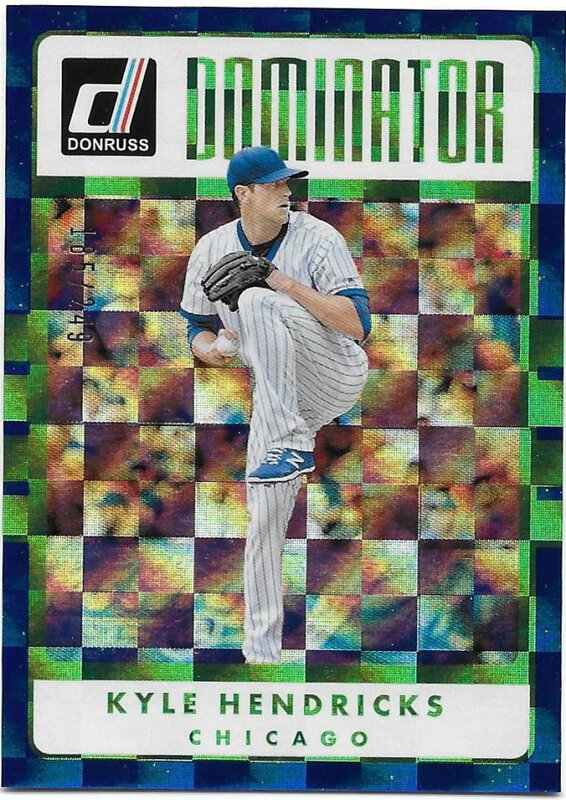 The card companies have taken some notice, of course and the cardboard quest has exploded since 2017. Overall, through 2018, I need 239 cards. For perspective, after 2016, it was only 55. 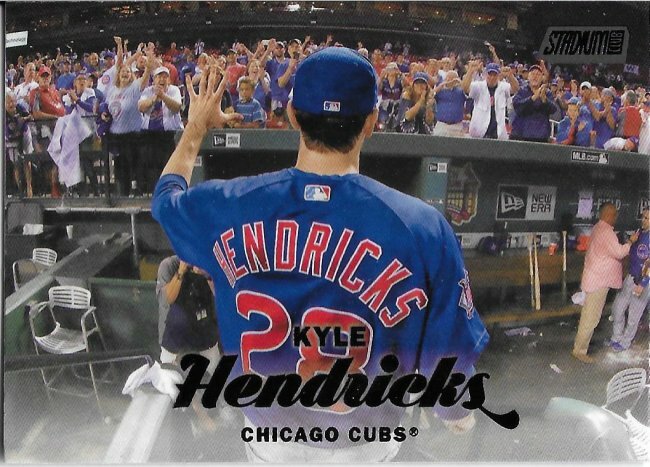 The good news is that there are so many other big Cubs names that Hendricks cards are pretty cheap. I guess that’s why I’m already over 25% done by the time this “introduction” went live. Hendricks is a good dude. He stays consistent and you usually know what you are going to get out of him. I’d happily have him on the Twins if that was possible. Absolutely! One of the things I like most is how quiet and unassuming he is. Which is odd, since I also love the flashier guys like Baez and Contreras because of their personalities. I know he’ll never fully live up to the Maddux comparisons, but I’m happy we traded for him.